From Google play store you can install so many free and paid apps on your Android Mobile, But when you are going to uninstall some of those apps from your Android Application manager, you have to uninstall those apps one by one. There is not option which helps you to select multiple apps and deletes all of them with a single click and this take lots of time to uninstall so many app from your Android smartphone. 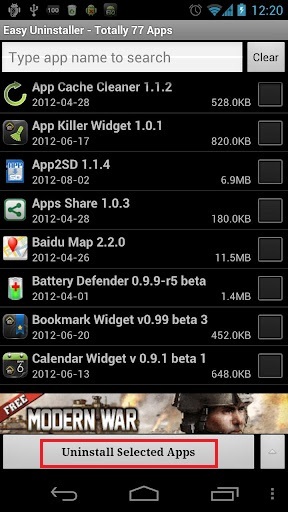 Now you can select multiple apps to uninstall with the free android app Easy Uninstaller. The app is available in Google play store and works on all android OS devices. Which is really useful and you can also search them by name or sort them by types. 1. Go to the Google Play store and install the Easy Uninstaller Free app on your Android Mobile. 2. Run the app on your mobile, here you can search and sort the app by keywords and names. Type the name of the app in the search box to uninstall the app. 3. 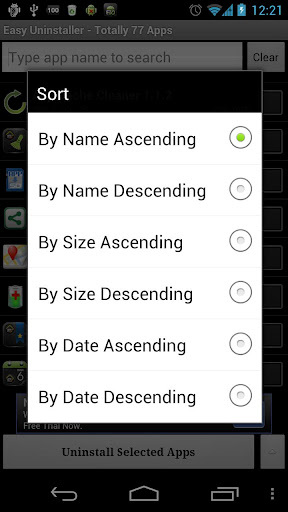 Also gives you the option to sort all you Android Apps by name, size and date on install. With this method you can search all your app easily in the mobile. 4. After this you can select multiple apps from the list to uninstall them easily. Select multiple apps that you want to uninstall, and click “Uninstall Selected Apps” button to uninstall them. The app will uninstall only those apps which are installed by you, it will not work on preinstalled apps, which come with your Mobile Phone. For uninstalling those apps you need to have the super users access on your phone which can be attained by rooting your device.